You can go anywhere from anywhere – a quote from Anni Albers is an exhibition by weaver Ismini Samanidou and film maker Simon Barker. 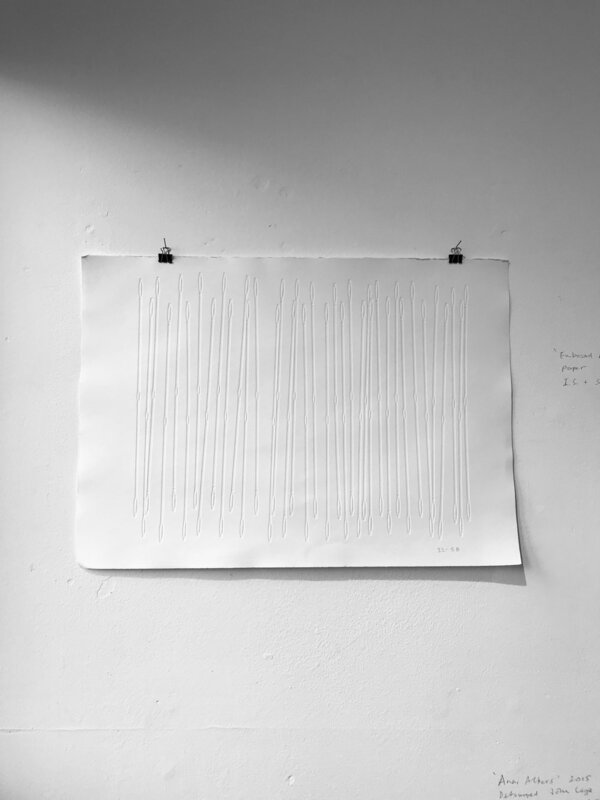 Inspired by Ismini’s residency at the Albers Foundation, the show features weavings, film, sound and installation work as well as an embossing and photographic print of objects belonging to the Foundation. The sound accompanying the exhibition was a piece of music, originally composed by John Cage, featuring instruments that depicted the Albers. Here, homage was paid to Anni alone; other instruments representing her husband had been stripped out. Weavings that were produced on Albers’ loom formed a major part of this small but very effective exhibition. The film ‘Continuous Line’ directed by Simon Barker (shown here and at the Tate) featured Ismini hand weaving these beautiful pieces of fabric using paper and silk yarn. A stand out piece was the photographic montage of weaving tools from the Anni Albers’ archive, hopefully to be reproduced with the permission of the Foundation. This really stood out for me, simple yet extremely effective. It was a beautifully produced piece of graphic photography showing the varied and fascinating objects typically found within a weaving studio. Loom heddles had also been borrowed to form ‘Heddle Construction’ a three dimensional installation as well as using them to form an embossing on paper. It was a real treat to see this small but perfectly formed show of Ismini’s and Simon’s. Anni Albers (1899–1994) was an innovative artist, designer, teacher and writer of twentieth century modernist abstraction, combining the ancient craft of weaving with modern art. She was introduced to weaving during her time at the Bauhaus, then a radical art school in Weimer, Germany. Albers explored the endless possibilities of hand weaving as a modernist medium, heavily influenced by pattern, line, knotting and texture. It was at the Bauhaus that she met her future husband, the artist Josef Albers and in 1933 the couple emigrated to the US after the rise of Nazism in Germany. Both became teachers at Black Mountain College in North Carolina, continuing with their experimental approaches to modern art, before Josef undertook a role at Yale University in 1950. This is the first exhibition of Anni Alber’s work in the UK, work that portrays what a hugely influential figure she was to both artists and designers. The exhibition examines her approaches, drawing on historical context as well as the future of weaving, including many other works which helped her to forge ideas about her work. It was incredibly exciting to visit this exhibition and I only became aware of it through Instagram posts about Katie Treggiden’s book, Weaving: Contemporary Weavers on the Loom. Being new to textiles study and weaving, (while I had some knowledge of Bauhaus), I wasn’t familiar with the work of Anni Albers. The exhibition is large and in-depth, comprising of 11 rooms featuring many pieces of Anni’s work across the many mediums she used. The first piece of work that immediately drew my attention for its structure, colour and simplicity was Wallhanging (top), woven in 1924 using cotton and silk. As to be expected, the Bauhaus style was prevalent in Alber’s work, strong colour and geometric lines featured heavily in her work, for instance in the preparatory work, Design for a Wallhanging 1926, Gouache and Pencil on paper. Albers also introduced the process of transferring letters, numbers and symbols into her work; ‘Typewriter Studies’ became a fundamental part of her classes. One of the Albers’ students Ruth Asawa produced a number of stamp drawings such as BMC Stamp 1950, Ink on newsprint. Print appeals to me greatly particularly with type (hence a graphic design background) and the repetition and sequence within these works correspond very well with the structure of weave. This is what I love about different mediums; they can initially be seen as unrelated, yet be incredibly interconnected. This has been very apparent when carrying out my own research. As mentioned, studying textiles is very new to me. One of the key reasons I believe weave appeals, is because of the involvement of order and structure as well as repetition and composition. The last room of the exhibition, Tactile Sensibility - something Albers was very much in favour of - consisted of tactile copies and swatches of Alber’s work which explored surface texture. The swatches were woven by weaver, Louise Anderson. Albers had a strong belief that technology dulled our awareness of the tactile as it replaced our need to use our hands. There were also skein samples; the types of yarns that Albers used, a mix of natural and synthetic fibres. It was interesting to see a variety of plant based fibres, something that I have a very keen interest in. Adjacent to this was a film made by Simon Barker featuring contemporary (and Sussex based) weaver, Ismini Samanidou working at Anni’s loom which was restored during her residency at the Albers’ Foundation in 2014. The film felt incredibly meditative. A short excerpt can be seen here https://www.bbc.co.uk/news/av/entertainment-arts-45996232/anni-albers-how-textile-artist-s-pictoral-weavings-inspire as part of a documentary on Anni Albers due to be shown this year. I have a lot to learn about the craft but also about the art of weaving. Wonderful stuff.